Scientists have created a melody that's truly out of this world, turning numerical data from two stars in our galaxy into music for a reggae-rock band. 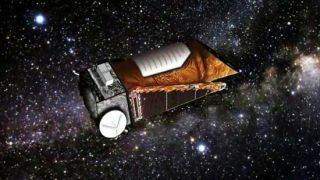 The star observations were made by NASA's planet-hunting Kepler space telescope. Researchers at Georgia Tech’s Sonification Lab converted the data into sound, at the request of the band Echo Movement, which wanted to infuse one of its songs with a heavenly melody. "The Sonification Lab receives a lot of requests to convert scientific data into sound, but this one was truly unique," Bruce Walker, a professor in Georgia Tech's school of psychology, said in a statement. "It’s not often that we have a chance to help an actual star compose music." Kepler's main goal is to determine just how common potentially habitable Earth-like alien planetsare throughout our galaxy. To get at this question, it stares continuously at more than 150,000 stars, measuring their brightness changes over time. The telescope flags certain recurring brightness dips, some of which are caused by alien planets crossing the star's face from Kepler's perspective. Since its launch in March 2009, the telescope has already detected more than 2,300 candidate alien planets, the vast majority of which will likely turn out to be the real deal. Sonification Lab researchers first looked at observations of a binary star known as Kepler 4665989, which dimmed and brightened each time its companion star crossed its path, researchers said. "Those numerical values were loaded into our Sonification Sandbox software to create sequences of sonified musical pitches," said Riley Winton, a psychology student and leader of the project. "The process put us on the right track." The scientists cleaned up the signal and removed some of the ambient sound, then sent the result on to the band. Echo Movement looped the sounds and composed them into a four-part harmony, researchers said. As a last step, the Georgia Tech team used data from a different binary star, known as Kepler 10291683, to add a tremolo, or trembling, effect. This created a more natural and less computerized sound, team members said. “People have made music with space sounds before, but largely using pulsars and space events that can be recorded in the radio spectrum. We wanted something completely off the chart," said band member David Fowler. "Discovering planets around other stars is a relatively new science worthy of everyone's attention and digs deep at the core of humanity's most basic quest to orient itself in reality." While making music from star variations was a neat and novel exercise, it also further demonstrates the value of sonification for sifting through large data sets, researchers said. "Sound is the best pattern recognition tool we have," Walker said. "Instead of visually scanning through a long list of numbers, looking for patterns or random occurrences, sometimes it’s easier to create an audio file and listen for them. Very interesting patterns can often be discovered by using sound." The team will present its results at the International Conference on Auditory Display (ICAD) in Atlanta, which runs from June 18 – 21.